Featured in the Portfolio: Clocks gallery, the design on this 9" diameter solid sycamore clock was commissioned for a wren lover. 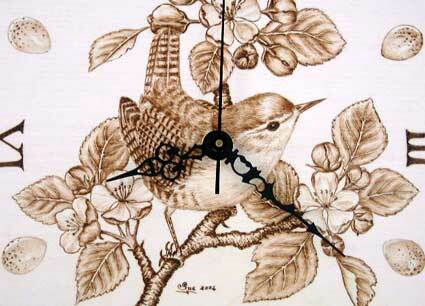 The brief was for the bird in typical cocked tail pose sitting in a branch of apple blossom. The first stage in the design process is to plan the composition. 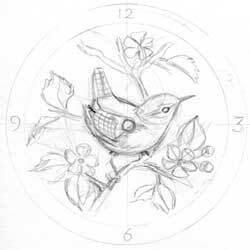 Giving careful consideration as to how the wren should be positioned in relation to the central hole of the clock, a rough thumbnail sketch of the proposed layout was submitted to the client for approval. Research revealed that the wren typically lays around 8-10 eggs in a clutch, so a combination of Roman numerals and eight speckled wren eggs were later included in the composition. 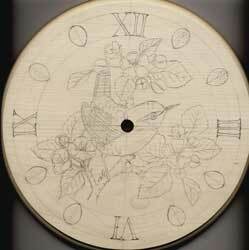 The final design was then worked up in greater detail and the outline lightly drawn with a soft 2B pencil directly on to the clock as a guide. Pyrography contrasts well with sycamore which is a pale, evenly grained English hardwood ideally suited to the medium. The sepia effect and tonal variations are achieved by burning the surface of the wood to various depths of brown. A variety of pyrographic techniques have been used to convey the different textures, as demonstrated in the detail of the finished design shown above. From the soft feathers of the wren to the smooth, glossy texture of the leaves and eggs; from the delicate blossom to the rough, knobbled texture of the branch. On completion the clock was given three coats of a non-yellowing satin varnish to seal and protect and fitted with a quality quartz movement and hands.